Itchy scalp and dandruff is a common problem especially among women who wear extensions and other protective styles. If you’re thinking of scratching or have been scratching in the past, stop! The worst thing you can do is scratch. It will make it worse, cause lesions on your scalp and leave a trail of flaky whiteness behind you. One of the things that can help alleviate this problem is adding a neem comb to your hair care regimen. The number 1 cause of an itchy scalp and dandruff is a dry scalp. 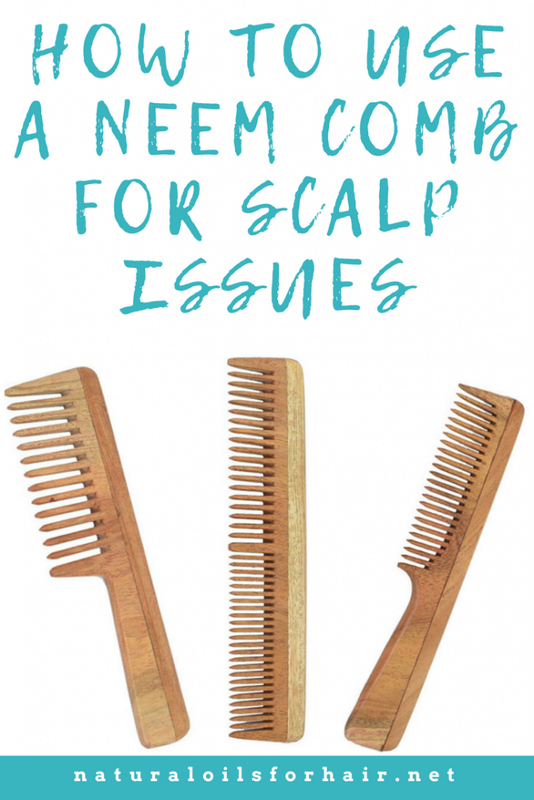 If you’re not keeping your conditioning levels up, your scalp will eventually dry out and lead to these issues. A dirty scalp can cause itchy scalp, dryness, and dandruff because of build up over time. Build up can be caused by products. Sensitivity to some ingredients in hair care or skin care products can lead to dandruff. This is aka contact dermatitis. Using too many products over a short period of time without taking the time to clarify in-between can cause these issues as well. An improper diet missing essential nutrients as well as vitamins such as zinc, iron and vitamins B. Certain scalp inflammation conditions such as psoriasis. In addition to the obvious solutions like adjusting your diet and maintaining moisture levels on your scalp to alleviate these issues, you can also include other solutions such as the use of a neem comb. What is a Neem Comb? 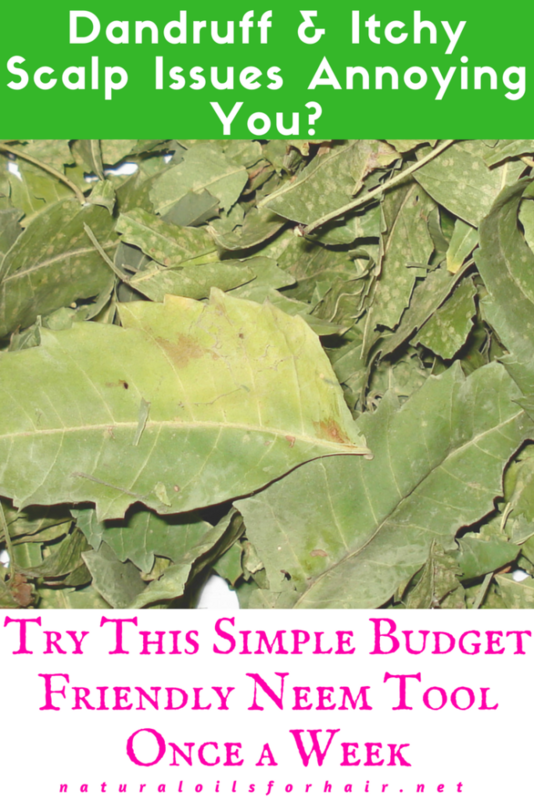 I covered neem oil and its uses for scalp conditions in Gentle and Effective Treatment for Scalp Issues with Neem Oil. 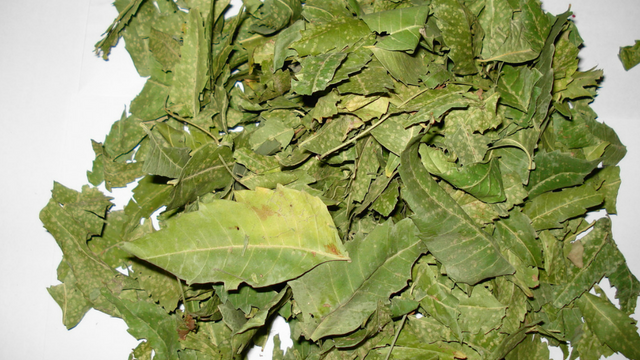 Neem is a medicinal plant with antibacterial, anti-inflammatory and anti-fungal properties used for its ability to heal scalp conditions and stimulate hair follicles for better hair growth. 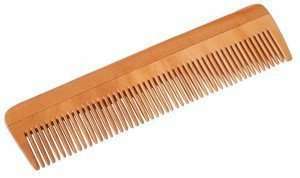 Neem combs are made out of the wood of the Indian neem and are similar to bone combs. It has a pleasant and refreshing smell, which should stimulate your senses while using it. The neem comb is more popular in India but women from other parts of the world are starting to catch on to it. Neem combs are anti-static, which means it won’t snap on your hair and cause frizz, flyaways and stiff hair. Hair charged with static makes it more susceptible to damage. Neem combs help with even distribution of product and detangling hair when wet. After finger detangling, use a neem comb to work the product through. It also distributes the scalps natural oils effectively. The tips of a good neem comb massage the scalp as you work it through your hair, and relieves symptoms of itchiness and dandruff over time. 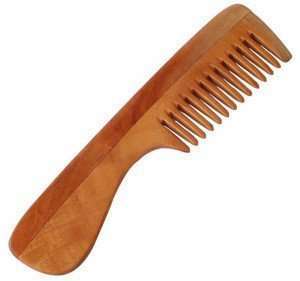 Additionally, neem combs strengthen and soften hair. They can also help facilitate hair growth through increasing blood circulation to the scalp. Neem combs are created with almost blunt points so you can rake it through your hair, massage & stimulate your scalp with it without causing any injury. The smooth teeth will glide through your hair. Use frequently to comb through the length of your hair while you have product on your hair, pressing gently against the scalp. You should begin to see an improvement within 2 days. 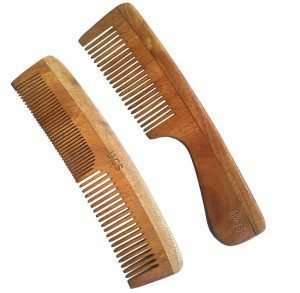 Wooden combs shouldn’t be cleaned the same way you would clean regular combs and brushes. Immersing wooden combs in water can wear it out and lead to cracks in the wood. Wash your neem comb in warm soapy water and don’t immerse for more than a few minutes. You can use an old toothbrush to gently remove the grease and dirt between the teeth. Afterward, rinse the neem comb with warm water and shake out the excess water then wipe dry with a towel. Pour a few drops of any hair oil on the neem comb and spread through evenly with your fingers. Store in a dry place till the next use. It’s important to keep your neem comb dry if you want it to last as long as possible. Does Neem Comb Help with Hair Growth? Combing hair stimulates your scalp and improves blood circulation. When circulation is enhanced, the scalp receives vital nutrients, which helps hair grow healthier and faster. You can do this with any comb but a neem comb has additional benefits, which also eliminate any scalp issues hindering healthy hair growth. For more simple solutions to common hair problems with oils, be sure to check out the How to Grow Your Hair Healthy & Long with Natural Oils guide. The guide features over 40 natural oils for hair care and growth as well as best tips for caring for hair with natural oils. Subscribers get up to 30% off.